East led the Q and West overtook it with the king, cashed the ace and played the ten. Declarer ruffed with dummy’s king, cashed the A, ruffed a spade, crossed to dummy with a diamond, ruffed a spade, cashed the Q, ruffed a club and played the J. East, down to Q QJ7 had to surrender. I can’t explain the bidding, but the play’s the thing. West started with three rounds of clubs and declarer ruffed with dummy’s jack, cashed the A and ruffed a spade, on which West followed with the king. When declarer continued with the top hearts and a third heart West pitched his hidden spade and the contract had to fail. 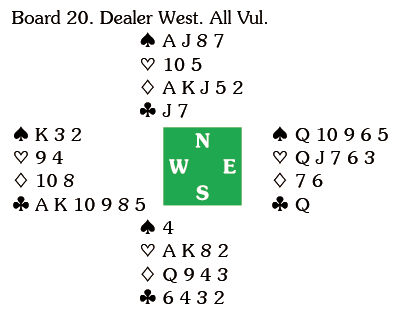 If declarer thought West’s K was a true card, there is something to be said for playing for trumps to be 2-2. If that proves to be the case declarer can then ruff a club, which will squeeze East in the majors – whichever suit he discards, declarer can establish the extra trick he needs by ruffing it out. This would have worked on the layout that actually existed, as well as the imaginary one. 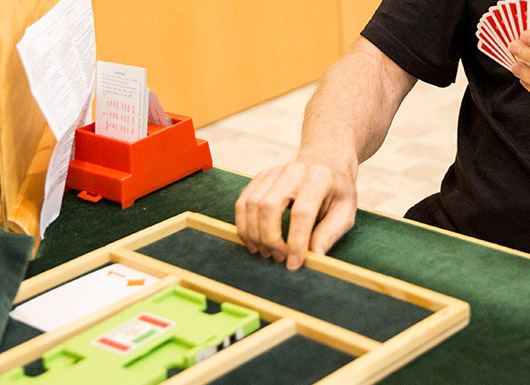 It was the line adopted by Thomas Paske in the match between Cayne and Allfrey – and was worth +750, as he was doubled.